But can you hear the sound of water? 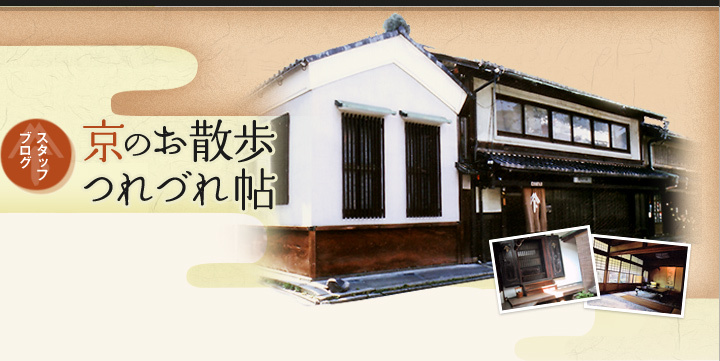 One afternoon, I received from shachō-san two tickets to attend tea ceremony at Zuiho-in the next day. Hardly able to control my excitement, I almost jumped in the air - perhaps not the most usual way of expressing gratitude. Zuiho-in is one of the twenty-four subtemples of Daitoku-ji, which is known as the head temple of the Rinzai sect of Zen Buddhism. 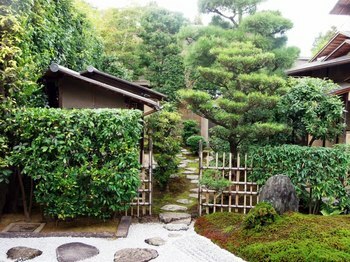 Also, it has been a centre for tea ceremony for centuries, being associated with Sen no Rikyu, one of the most influential tea masters, whose teachings have created the tea ceremony as it is known today. 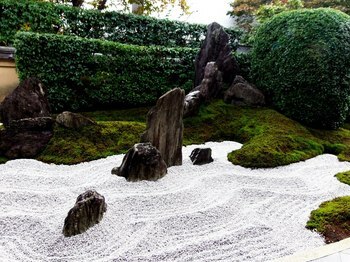 Sen no Rikyu believed in wabi-sabi, finding beauty in simplicity. 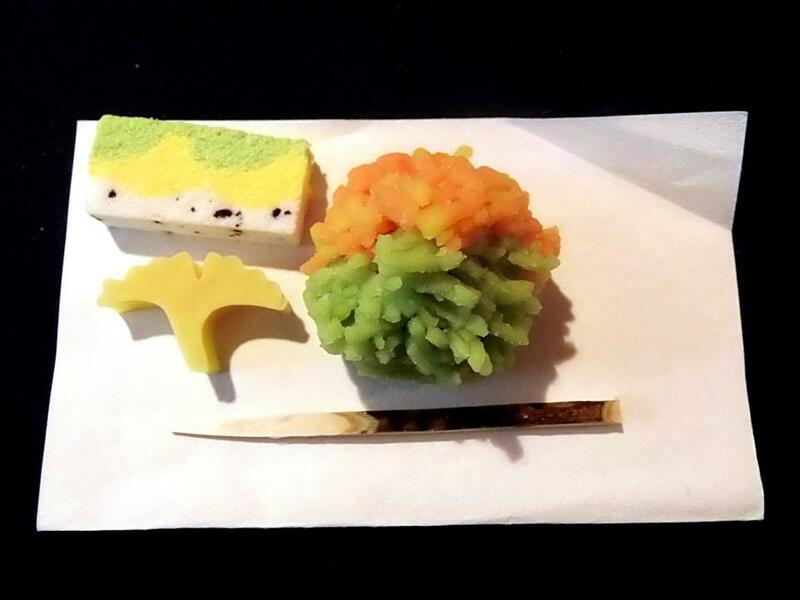 He was among the first to show preference for unpretentious, seemingly rustic utensils that were made in Japan, rather than expensive and extravagant ones imported from China. Just as well, the way he was designing the tea rooms or choosing the tea bowls and the decorative objects followed the same principles, which left a profound influence on all of the tea schools to come after him. We couldn' t find the temple on our first try and, after circling around the area for some time, I wasn't feeling exceedingly zen when we arrived. But I was really glad that my friend had managed to make it to Kyoto that day, and when we finally passed through the beautiful, 500-years-old gate, all my anxiety disappeared. Learning that there was plenty of time left for us to participate in the ceremony, we sat down for a while, admiring the beautiful dry landscape gardens designed by Shigemori Mirei. 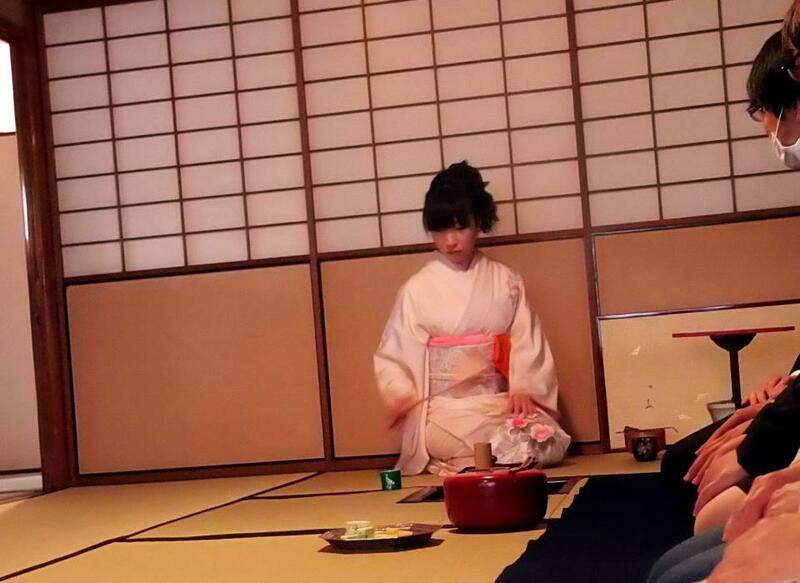 Having acquired a peaceful frame of mind, we were introduced to the young ladies studying the art of tea. The thought of a very formal, strict ceremony and the embarrassing mistakes that I was bound to make had worried me all day long, so I was relieved to hear that this was not the case. More than that, we were guided all throughout our experience by a very gracious student, who answered my myriad of questions patiently and thoroughly. I was impressed by the graceful way the hosts of the ceremony would conduct each of their movements, and felt a great inspiration to practice every day, in order to get closer to this ideal. tea will drink you up." The tea had taken me with it, and quite far at that, but I didn't even think of complaining. After the ceremony concluded with the ritual purification of the utensils, we were able to appreciate them from a closer distance. 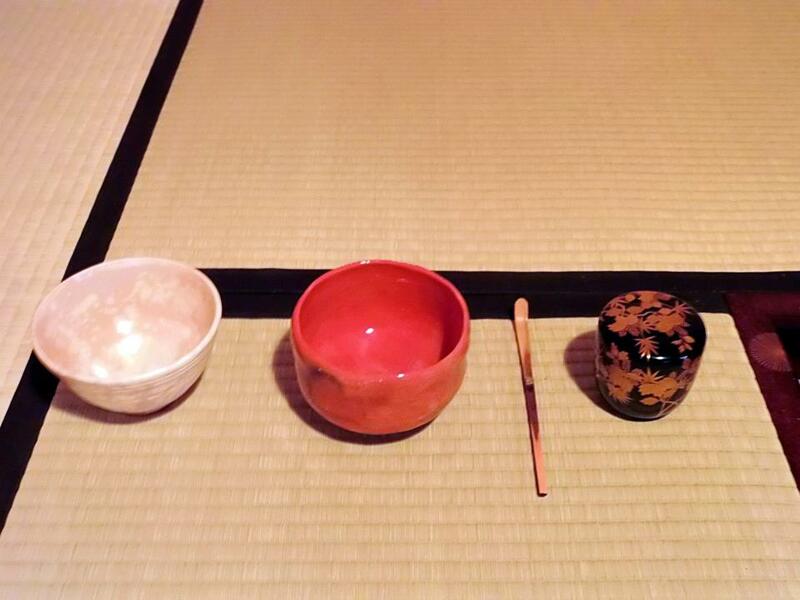 The bowls (chawan) were spectacular, as well as chashaku - the utensil used for scooping tea out of natsume - the laquered wood receptacle that encases the matcha powder. After taking the time to admire the scrolls displayed in tokonoma and expressing our gratitude to the hosts, we visited the rest of the temple and delighted ourselves with the sight of the gardens. As we still had time, we decided to visit Daisen-in temple as well, to admire one of the most famous Zen gardens in Japan, created through a very precise arrangement of gravel, stone, moss and small trees. Luckily, we were provided with an English guidebook, in order to understand and better appreciate the subtle beauty and overwhelming force exuding from the landscape. Just as well, we were kindly requested to turn off our cameras, in order to allow ourselves to fully experience the peaceful atmosphere of the gardens and the temple. The afternoon began fading into evening as we were following the course of the river flowing into the ocean, so we only managed to catch a glimpse of the main hall and the beautiful painted screens, just before the evening meditation began. Which makes me wish to go there again, and visit some of the other sub-temples of Daitoku-ji as well! It's almost been two months since I arrived to Japan. Still, everything seems just as new and exciting as it did during my first days. But Tondaya is perpetually changing, which reminds me that time keeps flowing by, no matter how much I'd like to freeze it to this very moment. Transition and seasonality are very important when it comes to the Japanese culture, being reflected in the gardens and domestic landscapes, as well as in the composition of the house itself. Traditional Japanese rooms build alcoves - tokonoma - into every room where guests are being received, decorating them with objects of artistic value, such as flower arrangements or hanging scrolls, called kakemono. These are constantly replaced, depending on the season and the occasion. As Tondaya is blessed with an extensive collection of such works of art, the moment of choosing a new scroll to exhibit is welcomed by everyone. Most of the kakemono displayed during the previous month celebrate the beautiful moon, its appreciation culminating with the moon viewing festival that took place on September 22nd this year. Now, time has come to pay tribute to the colourful autumn leaves, called momiji. Kyoto has a vast number of places where they can be admired in their full splendour, and I cannot wait to visit them all! or Kurama Fire Festival, takes place every year on the 22nd of October, the same day as Jidai Matsuri. I was really determined to see them both, but I could only make my way to the train station around 6 PM. I wouldn't really recommend anyone to go this late though, because the trains leaving for Kurama get fully packed in the evening. We had to let one pass in front of us and we barely managed to squeeze into the next one. As we were among the last to arrive at the mountain, we didn't get much choice of picking our spots. Ropes were lined along the sides of the streets and dozens of police officers were scattered all over, in order to make sure everyone was enjoying the festival in a disciplined and responsible manner. This might seem a bit too much, but the number of visitors easily surpasses 12.000, which could quickly turn the festival into a horrifyingly hazardous experience, considering the extremely narrow streets on which the gigantic torches are paraded. That being said, if you are willing to look past all of the logistical details, you are in for an truly memorable experience. The festivity dates as far back as 940 AD, and it began as a harvest holiday, celebrating the return of the kami (gods) to their home shrine. 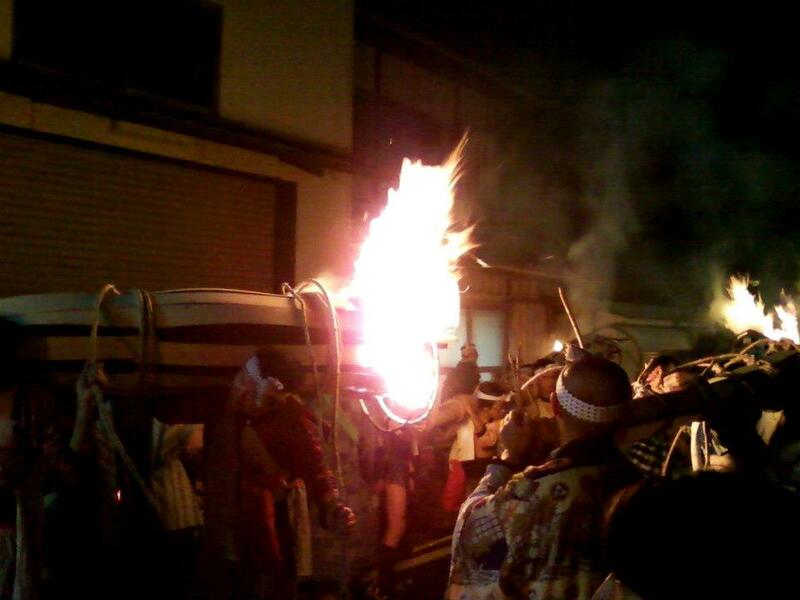 At 6 PM, kagaribi - or bonfires - are being lit in front of all the houses at once, after which the villagers grab their pine torches (taimatsu) and proceed in the direction of Kurama-dera Temple, marching to the sound of the taiko drums. Children holding smaller torches and chanting "saireya-sairyo" lead the procession, followed by the adults, carrying massive torches that can weigh up to 100 kg, in the direction of the Yuki Shrine. Starting from there, two portable shrines (mikoshi) are carried all across the village. After arriving at the bottom of the mountain, offerings are made to the gods, while the people dance around the bonfires, up until midnight, when the two mikoshi return to the shrine. Unfortunately, I didn't get the chance to witness the last part, because it was very crowded and we were afraid we'd miss the train back to Kyoto. But the parts that I did experience were incredible. The hypnotic sound of the drums and the timeless chants, the men who could still find the energy to jump up and down, even stooped under their flaming burdens, the beautiful mountains surrounding the village... It's overwhelming to the point where it inspires a kind of religious awe, even within non-religious people. On the way back to Kyoto, we could admire the autumn leaves, that were just beginning to change colours. From what I have heard, it looks amazing at the end of November, when all of the evening trains slow down, so the passengers can admire the spectacular scenery. I'd love to go to Kurama again and see for myself!